1. Grease and flour two 9x1-1/2-inch round baking pans or one 13x9x2-inch baking pan. In a small bowl stir together cocoa powder and food coloring. In a small mixing bowl stir together flour and salt. Set pans, cocoa mixture, and flour mixture aside. 2. In a large mixing bowl beat shortening with an electric mixer on medium to high speed about 30 seconds or until softened. Add the 1 1/2 cups sugar and 1 teaspoon vanilla to shortening and beat until well combined. Add eggs, one at a time, beating on medium speed after each addition until combined. Beat in cocoa mixture. Alternately add flour mixture and buttermilk, beating on low to medium speed after each addition just until combined. Stir together baking soda and vinegar. Add to batter, mixing until combined. 3. Pour batter into prepared pan(s). Bake in a 350 degree F oven for 30 to 35 minutes (about 30 minutes for 13x9x2-inch pan) or until wooden toothpick inserted near the center of each cake comes out clean. Cool cake layers in pans for 10 minutes. Remove cake layers from pans and completely cool on the wire racks. If using 13x9x2-inch pan, do not remove from pan; completely cool it in pan on a wire rack. 4. In a medium saucepan, using a whisk, blend milk into the all-purpose flour. Cook and stir over medium heat until thickened and bubbly. Reduce heat; cook and stir 2 minutes more. Cover surface with plastic wrap. Cool to room temperature (do not stir). In a mixing bowl beat butter, the 1 cup sugar, and 1 teaspoon vanilla with an electric mixer on medium speed until light and fluffy. Add the cooled cooked mixture, 1/4 cup at a time, beating on low speed after each addition until smooth. Spread over cake. If desired, decorate with candies. Cover and store in the refrigerator for up to 3 days. Makes 12 servings. Make-Ahead Tip: Prepare and bake layer cakes as directed; cool completely. Do not frost. Place the cakes on a baking sheet and freeze until firm. Once firm, place cakes in 2-gallon freezer bags and freeze up to 3 months. Before serving, thaw at room temperature several hours. Frost as directed. I have already written my review for this delicious frosting recipe. 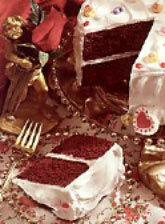 Btw,it's the ONLY frosting you should ever put on a red velvet or red Waldorf cake. I just wanted to add that if you are piping this onto cupcakes,you will need 1 plus a half recipe of the frosting for 24 standard cupcakes. Also, make sure your cooked flour mixture is completely cooled before you add it to your creamed butter and sugar. Beat it well for at least a few minutes.